SSLC is a commercial space launch vehicle and spacecraft manufacturer with advanced technologies in propulsion systems. Incorporated in 1999 as a spin-off company of Microcosm, and headquartered in Torrance, CA, the company’s patented all-composite pressurized structures are widely recognized throughout the aerospace industry. SSLC is a qualified supplier to aerospace and defense companies and has consistently attained supplier performance ratings at the highest level. SSLC has developed an innovative, award-winning line of all-composite cryogenic tanks called Pressurmaxx, which is characterized by carbon fiber material and SSLC’s proprietary cryogenic resin formulation, termed Sapphire77. Tanks can be built in a wide range of sizes and aspect ratios for different applications. The tanks have been successfully tested at cryogenic temperatures down to –321 deg F, and at pressures up to 8,000 psi. This high performance is available at lower cost and shorter lead time than traditional composite-overwrapped pressure vessels (COPV) or metallic tanks. The SSLC composite tanks are characterized by patented technologies like all-composite polar bosses (including the boss threading), incorporation of external structural stringers and internal slosh baffles, and special tooling production. The tanks are unibody structures and can become the primary structure of a launch vehicle or a spacecraft. Additionally, SSLC also commercially sells tanks incorporating a positive expulsion device (bladder), which is used for spacecraft in-space propulsion. The applications of the Pressurmaxx tanks are not limited to space, but span the Aeronautics, Unmanned Aerial systems (UAS), Unmanned Underwater Vehicles (UUV), automotive, Energy, industrial, medical, military, and special ops fields, and possibly more. 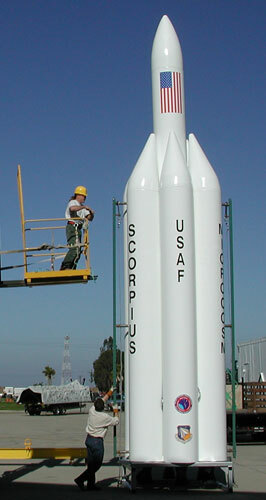 Microcosm developed the designs for the Scorpius launch vehicles and the component technologies through extensive R&D contracts from the U.S. government—from multiple agencies—along with internal funds, over a period of 21 years. This system engineering, hardware design and development, and software development activity is a core competency area for Microcosm and continues to provide innovative, responsive, low-cost launch technology. Our applicable launch system development technical skills include overall launch system architecture development, launch vehicle systems engineering, structural design and analysis, propulsion system design and analysis, aerodynamic and thermodynamic analysis and simulation, as well as flight and ground test equipment and supporting software, vehicle avionics hardware and software development, and defining a responsive launch system concept of operations. The Demi-Sprite launch vehicle is a small, on-demand launcher that can put up to 160 kg into LEO. It consists of a core stage which is actually the SR-M suborbital vehicle, surrounded by 6 identical pods that compose stages 1 and 2. Demi-Sprite provides true Launch-on-Demand service from a flat pad with minimal infrastructure within 8 hours of arrival of the payload at the launch site. It is capable of all-weather launch through 99.9% of winds aloft. It is scalable to much larger vehicles using the same technology and basic vehicle design. The very strong, low-mass, all-composite, unibody structure/propellant tanks allows elimination of turbo pumps that make most modern rockets extremely complex and high risk products. The only moving parts on the vehicle are valves and gimbals.